German poet; born 1731 in Breslau; died there April 3, 1790. His parents had chosen for him the career of a student of the Talmud; but his faith had been shaken by the influence of a skeptic teacher, and he preferred to enter his father's business. In spending all his spare time in reading and studying, he acquired a substantial knowledge of Latin and modern languages and a general education quite unusual among the Jews of his time. After the death of his father (1755) he at first associated himself with his brothers in business; but in 1763 he accepted a position with his uncle Veitel Ephraim, the well-knownmedalist and jeweler to Frederick the Great, and became intimately connected with Moses Mendelssohn and his friends. But in spite of his considerable fortune he soon got into financial difficulties, due largely to indiscriminate charities and to his somewhat irregular mode of living. In 1768 he surrendered his position with his uncle, and with the remainder of his money began to travel, taking with him his library, from which he would not separate himself. He wandered through Holland, France, Switzerland, and some parts of Germany, where he often was deeply humiliated by the imposition of the "Leibzoll" (personal tax). These travels completed the ruin of his fortune as well as of his health. In Saxe-Coburg-Gotha he was fined heavily for evading the toll, and had to sell his clothing in order to get to Breslau. There his brothers took care of him and endeavored to let him lead a quiet life; but the misfortunes of his career darkened his mind and caused him to isolate himself. Soon his melancholy turned into a madness that lasted for six years, though with brief intervals of sanity in which he wrote some of his best poems. After having recovered, he devoted himself wholly to poetry, till in 1786 he was stricken with apoplexy and remained robbed of all power of movement, and almost of speech, until his death. In his poems Kuh vividly expresses his patriotism and his reverence for Frederick the Great; but he expresses also resentment at the bad treatment of Jews in Germany and scorn at his own and others' failures and weaknesses. His poems were greatly esteemed by Mendelssohn and other contemporaries. 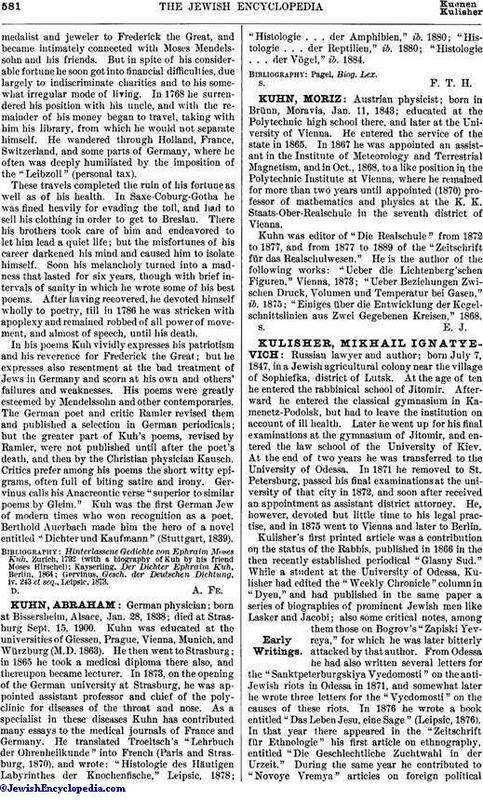 The German poet and critic Ramler revised them and published a selection in German periodicals; but the greater part of Kuh's poems, revised by Ramler, were not published until after the poet's death, and then by the Christian physician Kausch. Critics prefer among his poems the short witty epigrams, often full of biting satire and irony. Gervinus calls his Anacreontic verse "superior to similar poems by Gleim." 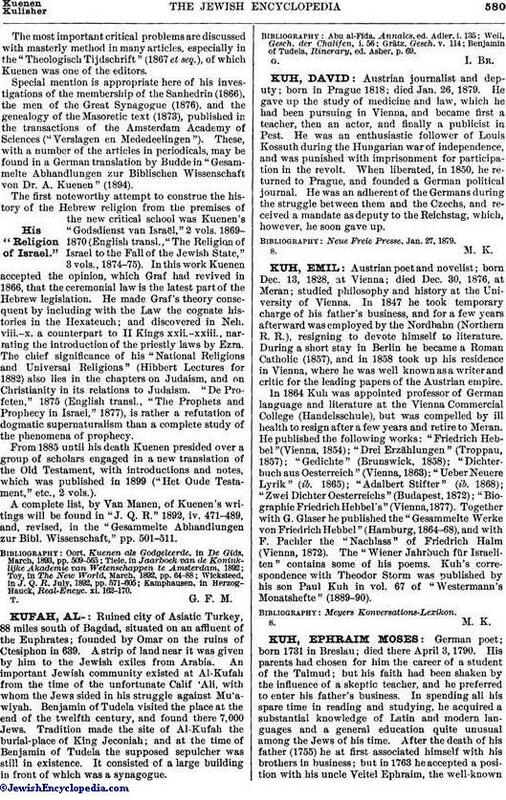 Kuh was the first German Jew of modern times who won recognition as a poet. Berthold Auerbach made him the hero of a novel entitled "Dichter und Kaufmann" (Stuttgart, 1839). Gervinus, Gesch. der Deutschen Dichtung, iv. 243 et seq., Leipsic, 1873.